Home Uncategorized Where to Find the Best Regional American Barbecue in L.A.
Barbecue at Maple Block Meat Co.
Where to Find the Best Regional American Barbecue in L.A.
With a number of noteworthy smokehouses setting up shop from the Valley all the way down to the South Bay, L.A.’s barbecue scene is finally starting to heat up. As a catch-all term, barbecue — which simply means cooking with fire and smoke — conflates many distinct styles of cooking defined by regional specificity. But within that general framework are countless variations. Here’s a brief guide to each style, and where to find the best version of it here in Los Angeles. 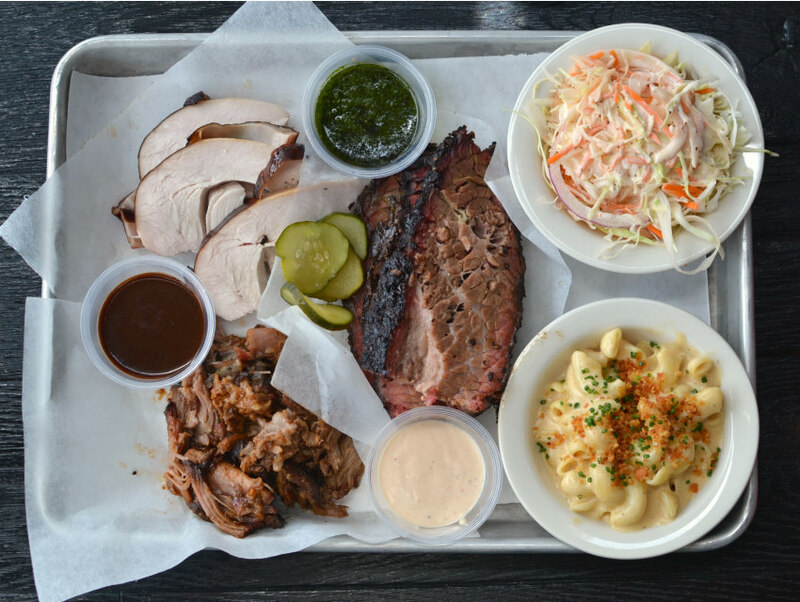 Texas barbecue consists predominantly of dry-rubbed beef and specifically smoked brisket, and the two best places in the city to experience it are Maple Block Meat Company (3973 Sepulveda Blvd., Culver City), and Horse Thief BBQ at Grand Central Market (324 S. Hill St., downtown). “Our process is most closely related to Central Texas, with the philosophy of using very simple dry rubs, smoking with whole logs, keeping all sauce on the side, and in general trying to smoke each piece of meat to the best of our ability and letting the flavor of the meat and smoke stand on its own,” Maple Block owner and pit master Adam Cole says. He didn’t set out to define the restaurant as Texas-style, but he thinks the popularity of Maple Block’s brisket has something to do with it. Wade McElroy of Horse Thief BBQ welcomes the Texas label. “We are from Texas and that style was our original reference point,” he says of his three-year-old downtown eatery. “We use a dry rub method with our signature spice blend and we serve a brisket we’re quite proud of.” And with good reason: Tender and exploding with salty, smoky flavors, this brisket is worthy of significant praise. In the United States, Memphis barbecue typically refers to slow-smoked pork shoulder and ribs, served either dry, or with tangier barbecue sauce. Baby Blues in Venice is one of the best places in the city to find Memphis-style pork ribs. Rubbed in spices, and finished in a sweet and tangy house-made BBQ sauce, they are an authentic retelling of a West Tennessee tradition. Other Memphis-style standouts include JR’s (3055 La Cienega Blvd., Culver City) which plates a full slab of saucy ribs for $22 in Culver City, and Brothers BBQ (7725 Crenshaw Blvd., Hyde Park) — which features a generously-drenched rib tip special. For a lesson in Carolina cuisine, try the San Pablo Pulled Pork from The Park’s Finest (1267 W. Temple St., Echo Park). While it’s not expressly advertised as such, the shredded shoulder meat, smoked for 16 hours and bathed in a light vinegar sauce, is an unbeatable taste of the Tarheel state. Both Hiatus Urban BBQ (1292 S. La Brea Ave, Mid-Wilshire) and Bludso’s Bar & Que (609 N. La Brea Ave) serve up sensational examples, in sandwich form. The former adds sweetened mustard and Asian slaw between the buns, while the latter shines best naked. With it’s expansive array of sweetly-sauced meat, JNJ Burger Shack (5754 W. Adams Blvd, West Adams) evokes the spirit of Kansas City barbecue, a regional style known for its wide variety of smoked meats, slathered in thick, molasses-rich barbecue sauces. JNJ Burger Shack is one of the rare L.A. restaurants to offer burnt ends; barked, fatty chunks of brisket made famous in western Missouri. The beef hot links here are similarly sensational. A couple of barbecue joints paying high praise to KC’s legacy include Max City (4729 N. Eagle Rock Blvd., Eagle Rock) and Phillips (2619 Crenshaw Blvd., West Adams). And although it’s infused with Asian flair, the Hungry Pig (2920 W. Temple St., Westlake) leans heavily on a diversity of meat and sauce, drawing parallels to the Kansas City category. California technically already has its own style of barbecue known as Santa Maria, which is defined by beef tri-tip grilled over live oak coals from the Central Coast, but local chefs are hopeful that one day L.A. may develop its own barbecue identity. “To me, it seems wrong or false to consider yourself anything other than where you are,” says Cole. “Perhaps, if we are lucky enough… and L.A. continues to develop as a barbecue culture, our own style will be realized.” In the meantime, the city’s doing an exceedingly delicious job honoring those other regions that made American BBQ famous.